The Hyundai Genesis Coupe base model 2.0 turbo with a manual starts at just $22,000 the company just announced here at the 2009 Chicago Auto Show. The 300 HP V6 model starts at just $25,000. A pleasingly low $22k buys you the 210 HP turbocharged inline four Genesis Coupe and the 300 HP 3.8 liter V6 equipped with a proper six speed transmission is only $25,000. Pinch us. Of course, prices for both go up from there, but we're talking bona fide bargain here. The last time horsepower was this cheap was back in the days of the LS1-powered Chevy Camaro. If you want to break the bank, you can go for a fully-loaded, V6-equipped track model with the shiftronic 6-speed transmission for $31,000... but why would you when you could have the manual for less? Full details in the press release below . CHICAGO, Feb. 11, 2009 – Hyundai Motor America announced pricing for the new Genesis Coupe, starting at $22,000 for a well-equipped 210-horsepower, 2.0-liter, turbocharged, four-cylinder engine 2.0T model and $25,000 for the 306-horsepower, 3.8-liter, V6 engine model. 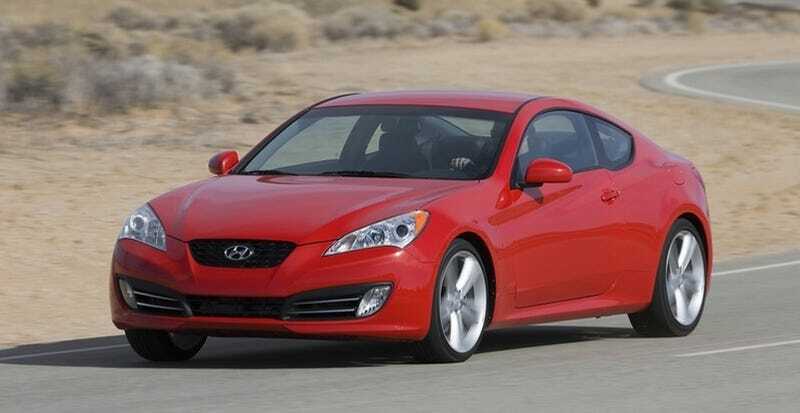 Genesis Coupe will begin arriving at Hyundai dealerships later in the month.